More than 3 million dogs live in shelters around the U.S. at any given moment, and many of these are “less-adoptable.” That includes special needs dogs, dogs with black coats and senior dogs. Indeed, a survey by Petfinder found that these less-adoptable dogs spend almost four times as long on the available-to-adopt database as do “normal” dogs. Adopting a special needs dog can change his or her life — and yours. While rescuing a special needs dog is a noble undertaking, it’s also a huge commitment, and you need to be completely ready before you sign the adoption paperwork. “Special needs” is a catch-all term for a variety of diseases and conditions and doesn’t mean one specific thing. A special needs dog may have a missing, deformed or paralyzed limb, or be blind or deaf. Some dogs with chronic medical conditions — such as diabetes, chronic allergies, and cancer — also are considered special needs. Certain social or behavioral conditions, such as severe separation anxiety or post-traumatic stress disorder (PTSD), may also count as special needs. Previously abused animals may fall into this category. Getting expert input is the best way to determine whether or not you’re a good fit for a special needs dog. A veterinarian can outline treatment plans and estimated costs for medical issues (more on that below), and a trainer can do the same for behavioral problems. Rescue personnel familiar with the pup can give firsthand insight into his or her daily life, and other owners of special needs dogs can tell you what challenges you’re likely to face. Special needs dogs sometimes need equally special living situations. 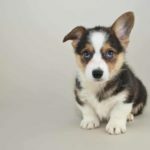 For example, a fourth-floor walk-up apartment might not be a great place to live for a dog who’s blind or is missing a leg, as this can make navigating the stairs difficult for them. Dogs who are chronically allergic to grass won’t be able to go out in the yard, even if you have one (at least, not without wearing doggie boots to protect their skin). Make sure your current residence can accommodate the dog’s needs. 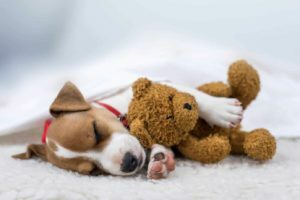 In addition to typical expenses—such as food, treats, dog toys, heartworm and flea medication and regular vet visits — your special needs dog might require extra care. This could involve training sessions, certain medications or surgery, and pet insurance usually doesn’t cover pre-existing conditions. Tally up all possible costs and see if your budget can cover it. After all, special needs dogs deserve forever homes that can take good care of them. Caring for a special needs dog is not a small commitment. Take stock of everything else you have going on in your life to see if you have the extra capacity to devote to a special needs dog. For example, if you have a job that requires you to work long hours or travel a lot, getting a special needs dog (or any dog) is probably not a great fit at this point in your career. Likewise, if you’re running after several little kids right now, it might be better to wait for a few years before adopting a special needs dog. Training or taking care of a special needs dog can be physically demanding. 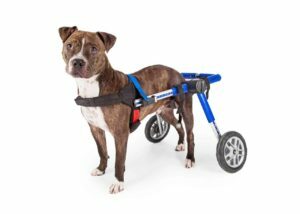 A dog that requires a wheelchair may need to be carried occasionally, while a dog that needs diapers will require a lot of bending over. 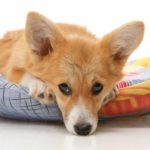 If you have health problems of your own, make sure that you’ll still be able to care for the physical needs of a special needs dog without endangering your health. Special needs dogs can sometimes navigate daily life just fine with some equally special training — but as the owner, you’ll need to get trained first. For instance, deaf dogs can be trained using visual cues, while you can train blind dogs to respond to verbal cues. Do your research and read up on training methods that fit your dog’s particular disability. After you’ve educated yourself, see if you can find a trainer in your area to work with both you and your special needs dog. Make sure you have what you need on hand to make adoption day go as smoothly as possible. 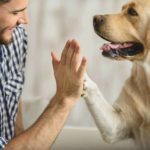 Calming dog treats can help pups with severe separation anxiety, while CBD products for dogs have been shown to reduce epileptic seizures, pain from cancer and nausea, among other things. If your dog has a food allergy, you’ll need food and treats that don’t include the allergen ingredient. 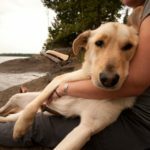 It’s important that you (and your roommate, current partner and/or kids) are on board and prepared to care for a special needs dog. If your job is too demanding, or your finances are not sufficient to accommodate a special needs dog, there is no shame in that. The best thing you can do for both yourself and the dog is to be honest about your capacity. Even if you can’t adopt a special needs dog right now, there are plenty of other dogs in shelters looking for their forever homes. Yes, your special needs dog has special needs, but he also has all the needs of a “normal” dog: a stable home, loving owners and plenty of belly rubs. Don’t forget that at the end of the day he’s still man’s (and woman’s) best friend, even if he might be missing a leg. Rescuing a special needs dog is a huge commitment, but it’s also rewarding. 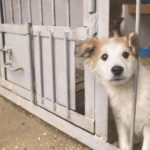 After all, you’re rescuing the dog from spending months (maybe even years) in the stressful environment of a shelter and giving her the one-on-one care and attention she needs. 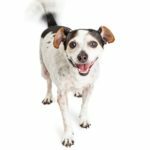 Just make sure you’ve consciously worked through these 10 action items before leaping to adopt a special needs dog.